You know when you have every intention to do something. You plan it, you set reminders for it, you HAVE THE TIME TO DO IT. But, for some unknown reason, you just cannot, for the life of you, complete it. Enter our choice last week of Gutsy Cooks Club. English Muffins from scratch and then you take those muffins and make the ultimate dish that said muffins were made for. Egg Benedicts. As you can see, the English Muffins part got DONE. The egg benedict part? NOT DONE. Can I give myself a C+ for effort? Up until yesterday I had every intention of making the egg benedict part of this menu. I do not have much of an excuse, since, I’m looking at two solid weeks ahead of me to just cook and blog until I start the new job so, I totally have nothing BUT time. Except that when you do have time, everyone seems to know it and then all sort of request start coming in at you – from everyone! Also, I have been a tad lazy. Now it’s Tuesday and I decided that the egg benedict was just not going to happen. Even today I woke up with the intention of doing this, a little thing called Law & Order got me a bit sidetracked and well here we are – nothing to show you folks, except how to make English Muffins from scratch. If you have never done them, you are in for a treat. Because, you are probably thinking, like I did, that these are like totally difficult to make and why bother when the store bought one are good. I’m going to prove you wrong. It took me a total of 10 minutes to put the dough together. Then 1 hour for it to rise. Then another 10 minutes to cut them up and set them up to rise another 30 minutes. Then about 10 more minutes to cook them up. Are you adding this up? So in less than 3 hours I was smothering butter and jam on my very own HOT homemade muffins, and swearing that I would never buy the so-so market brand again. If you do the first step the night before… you can have them ready in less than 20 minutes the next day. I don’t know about you, but it’s a win-win in my book. 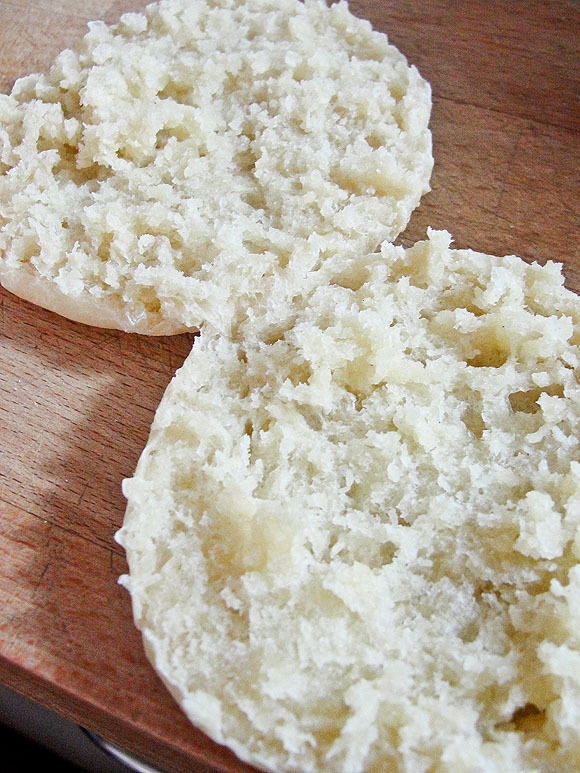 The other thing I learned is that english muffins are cooked in a griddle, not baked. Who knew? Once more I put my own twist on things and decided to change it up a bit, instead of using water, I used milk, and added a bit of sugar. The rest pretty much was the same of what the recipe called for. Mix the flour, yeast, and salt in a bowl. Make a well in the center, and pour in the water (or milk), sugar and butter. Stir to make a slightly sticky dough. Knead the dough on a floured work surface for about 8 minutes, until smooth and elastic. Shape into a ball, place in an oiled bowl, and turn to coat. Cover with plastic wrap. Let stand for 1 hour in a warm place until doubled. Line a baking sheet with a kitchen towel and sprinkle with most of the semolina. Turn the dough out onto a floured surface and knead. Divide into 10 balls. Place the balls on the towel and press into thick disks. Sprinkle with the rest of the semolina. Cover with another towel. Leave for 20–30 minutes, until risen. Heat a frying pan with a lid. In batches, place the muffins in the pan and cover. Reduce heat to low and cook for 10–12 minutes, until they puff up. Flip and cook for 3–4 minutes, until golden. The recipe yields about 10 muffins, while I was cooking the last batch; Tom had eaten 4 from the first batch. I ate 2 and we had to contain ourselves from totally finishing them in order to have at least some for the egg benedicts. They were crunchy on the outside, and nice and soft on the inside. We did toast them a bit more when we open them up and they were so good. We will never go back to buying them at the store. To see the other Gutsy Cooks take on this weeks menu visit their site/blog.